Video sites are hot and their popularity is sure to explode more in future. People love looking at video clips, and the search engines love video clip websites. Now you can cash in on the video craze by automatically compiling topic (niche) related video websites that people will love! Think about it, if you are like most people, the last time you visited a video site (like YouTube) you probably spent several minutes, to hours looking at videos - watching short video clips is fun and addicting! Now you can create an unlimited number of fun and addictive video websites, that people love to visit...with the click of a button! You can easily create video websites, related to unlimited niche topics! No technical know how is required. You dont need to know anything about YouTube APIs, PHP, MySQL, .htaccess or any other scary technical stuff. You dont need to be concerned with video site related issues like video storage or video bandwidth. YouTube hosts the videos that will be displayed on your site. You create the positive experience for your visitors, YouTube provides the videos, and Video Clip Websites ties is all together. Dont make the mistake of tying to build an all inclusive YouTube clone video site - you will never be able to realistically compete with huge corporate backed entities like YouTube! But, you can profit from segments of the huge video market, by creating niche sites, using YouTube videos - cool!! The huge video website market is now open to the little guy. 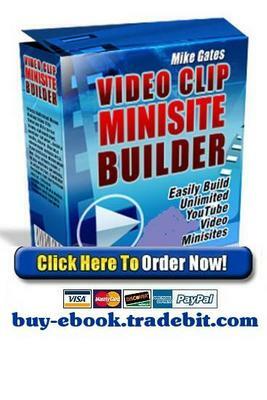 Introducing the Video Clip Websites Builder Script!!! Again, you really dont want to compete with the big video hosting sites. What you really need to do is focus on is building several topic related (niche) video sites. Lets imagine you are like me, and love fishing - maybe you even already have a fishing related website. Imagine FTPing a few files to your web host, running a program in your browser, answering a few questions, and clicking a button to create a multiple page, fishing video clip website - its really that easy. The best part is, you dont ever have to update the site. Whenever new fishing related videos are posted on YouTube, your site will update with the latest videos automatically, and the search engines love sites that are updated often. Since the videos on your niche video pages are actually stored and run from YouTube, you get the benefit of displaying the videos, but you dont have to pay for the video disk space or bandwidth. Each website and each web page is search engine optimized, based on the video clips being viewed. Each webpage contains Google Adsense code strategically placed for maximum click throughs. However, you are not limited to Adsense advertising. You can modify the Advertising Blocks to advertise anything you want. Maybe a few affiliate products related to your topic, perhaps a banner to your main site, or you could even charge a monthly fee to others who want that ad block space. Each page contains Web 2.0 Social Bookmarking code to allow your visitors to easily bookmark and share your webpages with others. Each page contains a link, you specify, in the footer of the page, and you can change it at any time. This will create traffic to the link you specify, plus incoming links - search engine food! Imagine easily adding video to any websites you currently own - your visitors will love it and the search engines will love it. Adding niche related video clips will increase the value of your web real estate and generate more repeat visits. Imagine creating unlimited new sites, or adding video pages to your current sites, with each site taking one to two minutes to create. Lets say you it takes you 5 minutes total to create a new video website, or set of new video pages. It should take less than 5 minutes, but well use 5 minutes in this example. In just one hour per day you could create 12 sites per day. So, if you spent one hour per day building video sites, for 20 days in your first month, that would be 240 video sites after your first month. Now lets assume each site averages only 30 cents per day, that would be $72 per day, or $2160 per month. The next month you could build more sites, or work on getting more traffic to your current video sites. Imagine your income growing as your virtual web real estate continues to grow. You could have unlimited money making web pages, on several topic specific websites, that visitors and search engines will love. Video will continue to be huge in coming years. Are you going to take advantage of this trend, or get left behind? Get the Video Clip Websites Builder Today and start creating a virtual empire of video clip websites. Ill even show you how to make the most out of your video sites, how get your site listed in Google in about 24 hours, and how to use Web 2.0 techniques to build traffic to your sites. The script is very easy to install, and takes no work to maintain. Just install it and let it go! You will also be able to earn money by referring people to the Video Clip Websites affiliate program - every page you create will have your affiliate link encoded in your pages. Okay - So Whats The Cost For This Incredible Video Website Builder? I was going to sell this package for $77 since I am allowing you to build an unlimited number of video websites on unlimited domains, and that would be a really fair price. But since I want to get this incredible YouTube website builder into as many hands as possible, I am going to start this package at a launch price of only $1.99! This is a true bargain, and I wont keep it that low for long. I will be raising the price to at least $77 in the next few weeks - and I dont know how long I will keep it that low! You can download the script and start building video sites within 90 seconds!